All over India folk dances play an important role of keeping up long established traditions. The dances are simple. They are created and performed for entertainment and religious reasons alike and for a variety of occasions. Often, they are an embellished expression of the lifestyle or skills the people of a particular region require. The costumes are always elaborate, vibrant, and laced with shimmering gold and silver. The layered, beautiful fabrics are just as important as the dance, props and music. 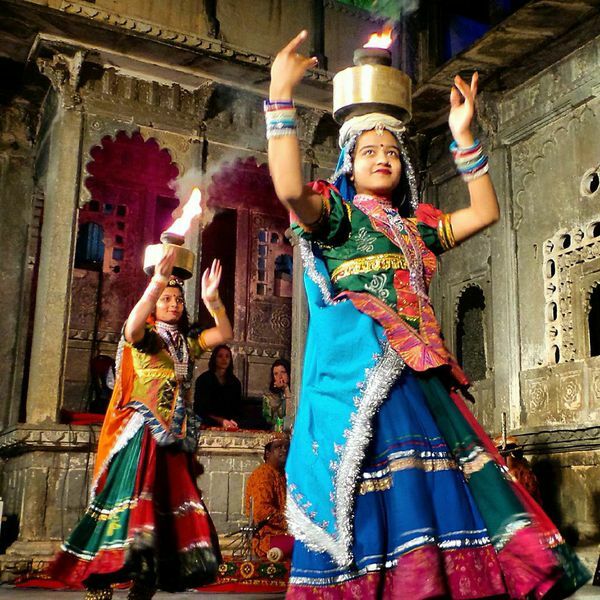 Within every state of India, there are many folk dances. These are the stories performed by people from the Rajasthan region. The Bhavai dance is almost like a circus act. While balancing pots on her head the dancer lowers herself to the ground and with her mouth removes a small draped fabric to unveil flowers in a vase. Next, she empties a bag of glass onto the floor and shifts her weight from one bare foot to the other. Following every trick, more pots are added. For the grande finale the woman swiftly circles the space, weighed down with eleven pots stacked high. Kalbelia is distinguished by its costume and movements. The dress worn by the dancer is black to resemble a serpent. The fluid movements and deep backbends mimic the grace and flexibility of a snake. 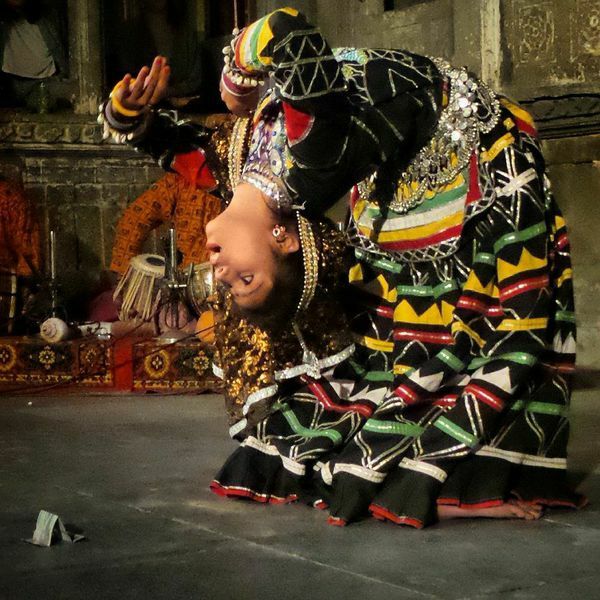 Ghoomar dance focuses on spinning. Their faces are covered in pretty veils as the women spin in tight circles gaining speed floating their beautifully ornate, colorful skirts in display. 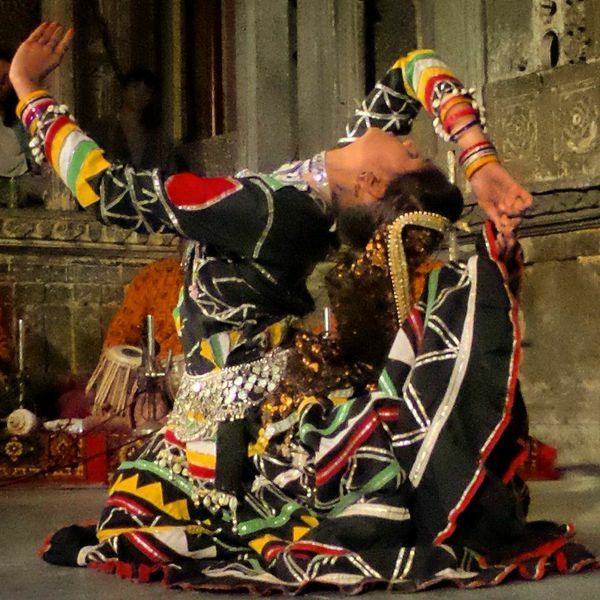 The Tera Tali dance is performed in various seated positions. Several small cymbals are strapped to the women’s legs and arms. With extreme accuracy, a cymbal dangling from their hand is swung forcefully to hit specific notes quickly and rhythmically. In the meantime they balance bowls on their heads and hold swords in their mouths. Chari has the dancers carry flaming gold pots atop their heads. The fire is kept carefully balanced as they transition from standing to lying all the while displaying intricate hand gestures and smiles. 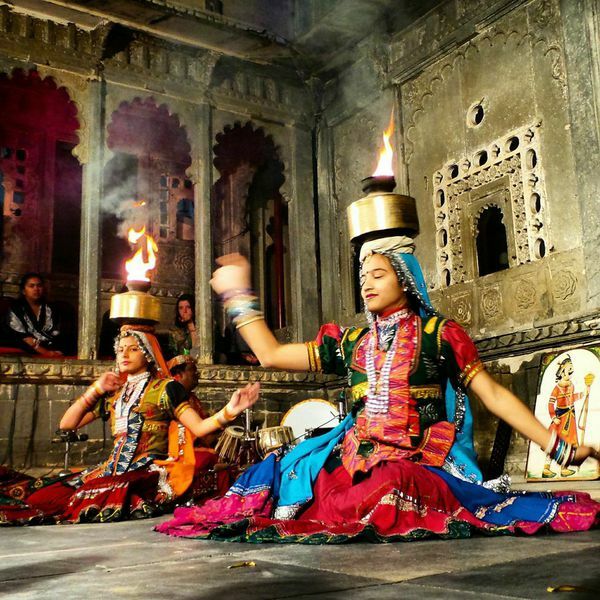 These folk dances are a vibrant glimmer into indian culture. The arts on many medians seems deeply embedded ino Indian life. Art is a universal, understandable thread amongst humans everywhere and one of the greatest ways to learn. 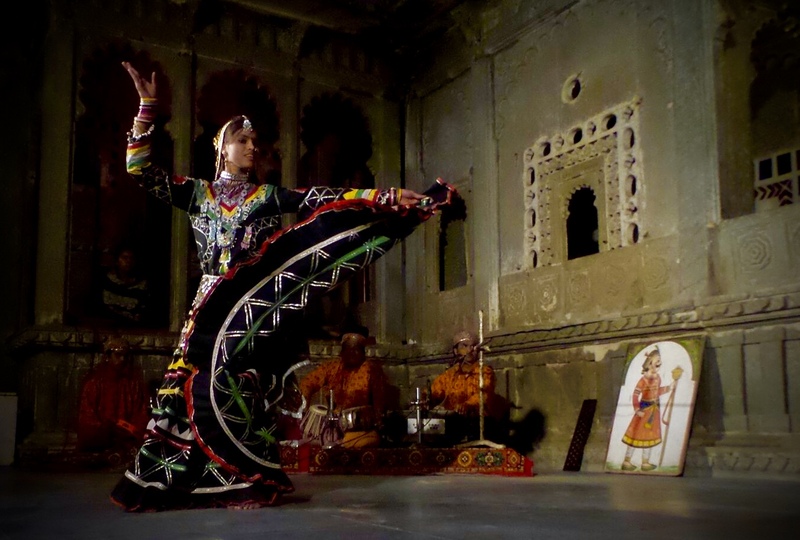 These dancers gracefully conveyed a journey through Rajasthan beyond the boundaries of language.